I was craving something quick, fun and familiar, so I dove into my Game Boy collection for something good. 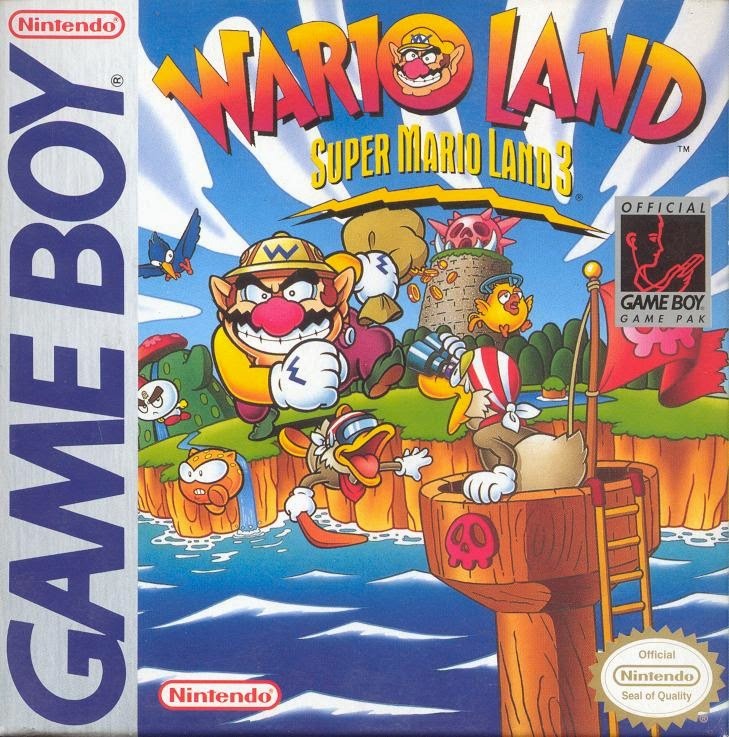 I happened upon my Wario Land trio, and decided it was time I give them another whirl, beginning with Super Mario Land 3, a.k.a. Wario Land! As I'm sure the title hints at, Wario Land is a classic platformer based largely on the very popular Mario games, but with the famed plumber's slightly-more-obese cousin at the helm. I've always had a soft spot for Wario; I find him comically sinister and happily choose him over his predecessors. My first impressions of Wario Land were that it's extraordinary fun, in spite of its simple gameplay. Upon replaying, I was surprised by how much of the game came back to me, including secrets! You do not need the manual to figure out Wario Land; I suppose the story isn't exactly presented clearly, but if you're familiar with our fat friend, you get the picture. Basically, pirates have stolen a statue of Princess Peach, and our clever semi-villain has concluded that if he beats the others to it, he can barter the statue back to the royals for lots and lots of money! That said, your adventure is served by Wario and Wario alone. The only other characters in the game are the baddies (save for one minor cameo at the end…)! I almost didn't bother with this article because I'm worried there is nothing newsworthy here, and I'd hate to sound like a broken record. But in this case, I don't think it can be avoided, these games are notorious for their difficultly and I think any life-long gamer would hold them amongst their top 10. Also, this list ended up being entirely retro (all NES, actually) because, as I think about it, retro games were always harder. Oftentimes these games didn't have difficulty settings to choose from, you only had 3 lives to complete the entire game, and they were based on (or are home versions of) arcade games, which were basically designed to be impossible to finish. They never held your hand. I don't think this generation's gamer really even comprehends what us old-schoolers have been through. So maybe you'll gain a little insight today, maybe you'll just plain agree, or maybe you have a different view of these titles altogether. Broken record it is! Here are my Top 5 Most Difficult Video Games. For my first foray into the PSVita I chose a game that I'm familiar and comfortable with elsewhere: Uncharted. Please bear that in mind as you read, as many of my opinions may actually be Vita-related rather than game specific, since I'm still getting accustomed to the console. Apologies if this annoys you. My first impression of Uncharted: Golden Abyss? I miss the 50-inch telly. It's significantly harder to clock headshots on this tiny screen with finicky controls. 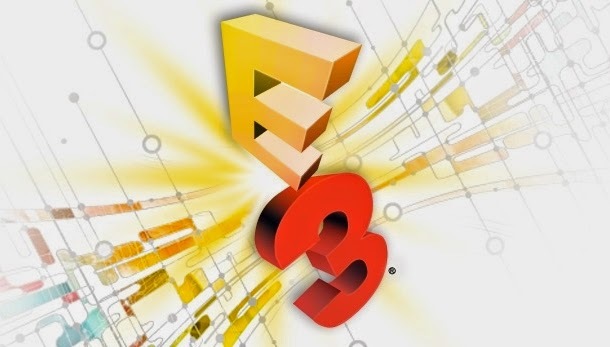 But other than that, the game looks familiar, sounds familiar, plays familiar… by all means this is an Uncharted game. 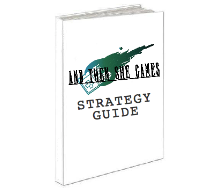 I noticed there seems to be less combat, and it's much easier to complete melee or stealth attacks in this version. Also, there is much, much more to do in Golden Abyss by way of treasure hunting. It was clearly designed for people who wanted Uncharted exploration on steroids. I quite enjoy these aspects of Uncharted though, so this is shaping up to be a great game! Uncharted has the unique distinction of being one of the first games on both of Sony's (at the time) recently released consoles. 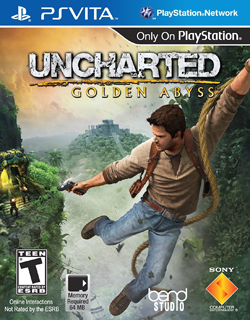 Drake's Fortune (insert shameless self-promotion) had the honor of breaking ground for the PS3, and Golden Abyss was one of the earlier titles for the Vita. Certainly between the two, the game looks infinitely better on the PS3, but I commend the artists of GA for their stunning backgrounds and competent level design.